Moka pots are one of the simplest and most low-tech ways to make a good coffee – unfortunately, that doesn’t mean that it’s easy to find a great one. The right moka pot will make great coffee for decades and can withstand house moves, camping, and being dropped a few times. We’ve reviewed the best moka post of 2019 to make your perfect pot easier to find. Does a moka pot make espresso? You can use a moka pot anywhere – on a stove, outside while camping, and on holiday if you’re self-catering. It’s easily packed and moved around, but that doesn’t mean it’s just a ‘back up’ coffee gadget. A good stovetop coffee maker brews consistently great coffee and can be your primary coffee maker. They’re perfect for lovers of simple black coffee, or even people with more elaborate tastes who don’t have much counter space or like to travel. It’s simple, reliable, and incredibly easy to use. Here are our top picks for 2019 to help you find the right moka pot for you. The Bialetti Moka Espress is a piece of history – this is the original moka pot that was patented in 1933 by Alfonso Bialetti. The design hasn’t changed technically or aesthetically since then and looks fantastic on your stove. However, if you need a pot that’s low-maintenance, it may not be the best choice – this moka pot is not dishwasher safe and should not be washed with detergent. Some users have complained about oxidation build up, but the Bialetti Express does not appear to build up any faster than other aluminum moka pots, it simply needs ongoing maintenance to stay clean and hygienic. You can buy this design in a variety of sizes, depending on your needs. It has an excellent reputation and if you want an original piece of coffee history in your kitchen, this is the best moka pot for you. First off, that’s not a typo – Cuisinox moka pots really do come with a 25 year warranty. A long warranty is always a great sign that the manufacturer is confident in their quality control, materials, and product overall. If the minimum the manufacturer expects the moka pot to last is 25 years, you can be quite confident that it’ll probably last a lifetime (if not longer). The Roma heats evenly and protects your coffee’s taste thanks to the fairly thick stainless steel walls. It has a great design and a mirror finish that looks more timeless than modern. The handle is stainless steel so doesn’t loosen or come off, but it is prone to heating up if you do not put hot water into the pot. The size is great for people who love dinner parties or a coffee-loving household, but if you’re a solo coffee drinker it’s far too big for single-servings or even a few cups of coffee. 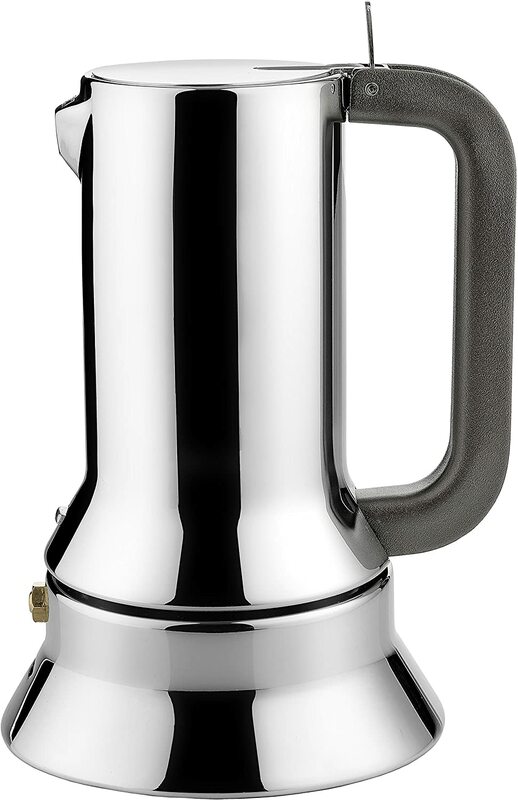 The Pulcina is a work of art – the segments make up a curvy and stylish moka pot that looks fantastic in any kitchen. It’s named after a ‘chick’ and you can see that the spout looks a little like a beak and the body of the pot could look a bit like a cartoon chick… if you squint. Its design is more than just beautiful – it also stops you from burning your coffee by automatically stopping the filter at the right stage to make sure that you don’t have to worry about taking a phone call or a shower while your coffee brews. It’s even been designed to be slightly bottom-heavy so you don’t need to worry about the moka pot toppling over if you knock it slightly – the curves and proportions really are the product of in-depth research rather than just making it look good. A brilliant moka pot if you’re happy to spend some money on something that looks beautiful while it makes your coffee. 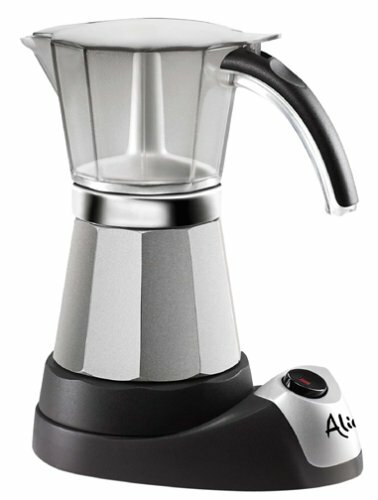 The Alessi 9090 is generally considered top of the range when it comes to moka pots – the build quality, complete lack of plastic, and details such as the copper handle, justify the price tag and show you that there is still a serious different between the top and bottom end on such a simple product. The design is simple and elegant, and actually won a number of awards including the 1979 Compasso d’Oro Award (I tend to think design awards mean more than they’re coming from Italy). It makes delicious, rich, and creamy coffee and is probably the closest you’ll get to a ‘real’ espresso from a moka pot. If you want the best moka pot that money can buy, this is probably it. You can probably buy a low-end espresso machine for the same money, but this is a far better investment for a serious coffee lover. 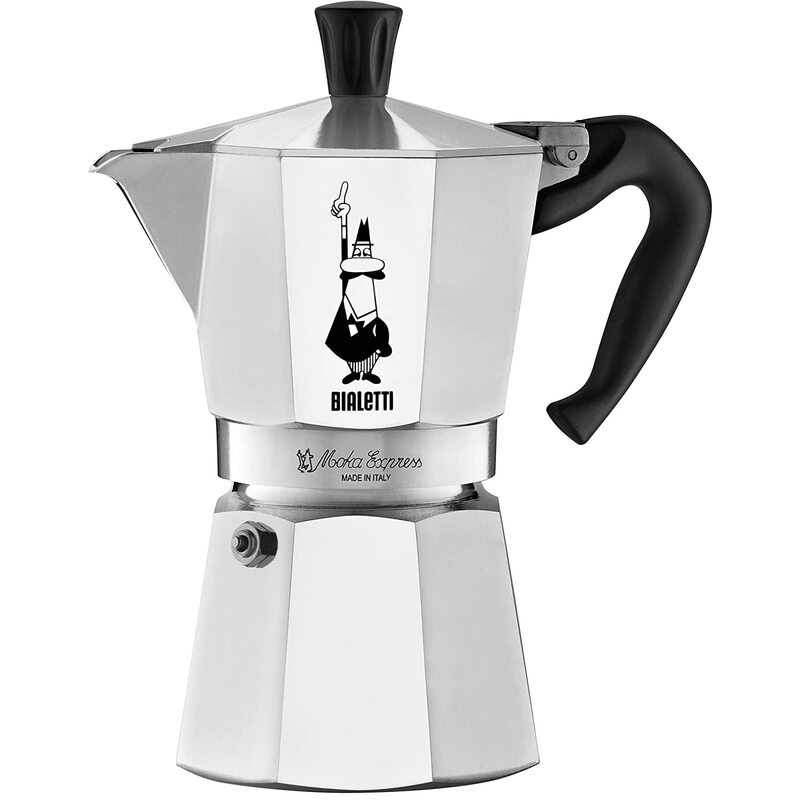 Bialetti didn’t just make the classic Express moka pot – they designed a variety of shapes, including the less angular Kitty. 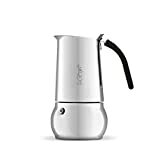 It’s made of heavy gauge stainless steel, which protects the coffee from overheating quite as quickly and means that this moka pot can be used on all stove types (electric, gas, and ceramic). This pot can even be cleaned in the dishwasher! However, there are a few drawbacks. For example, parts of the pot such as the ‘arrayo’ or recessed area are difficult to reach and keep clean. That said, for its price bracket is a very well-made and versatile moka pot. 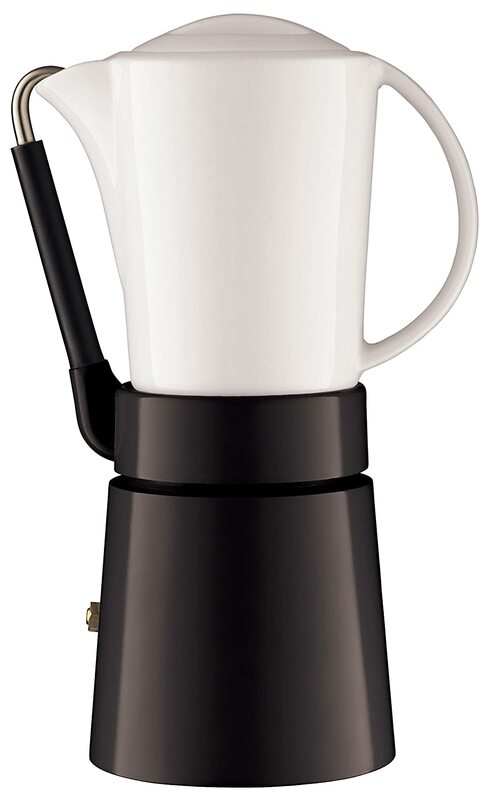 If you want to see how moka pots have evolved, look no further than the Aerolatte Café Porcellana, with its simple design and porcelain top, the moka pot is easily detachable, dishwasher safe, and protects your coffee from burning for far longer than a traditional moka pot. The pot is quite small so is best for solo coffee drinkers or smaller households. The major design flaw is that you need to tilt the upper part to detach it from the base, which can spill coffee if it’s completely full. The base also holds more water than the top, so it takes some time to learn how to avoid overfilling it so avoid spills. 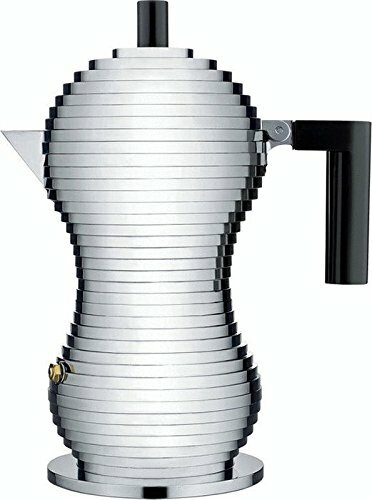 All in all, it’s a good looking and unique moka pot for smaller households. If you want to move away from classic stovetop moka pots completely, here’s an electric version that will make your coffee with no real supervision needed. The heater automatically shuts off so there’s no danger of overheating or overflowing, and it’ll even keep your brewed coffee warm for up to 30 minutes if you’re not ready to drink it straight away. Convenience usually comes with a compromise though – with the DeLonghi Alicia, that’s in terms of aesthetics and ease of maintenance. The top is extremely easy to clean, but the bottom is more of a challenge since you can’t get the electrical components wet. The entire moka pot includes a lot of plastic too, which can put some people off when compared with the beautiful metal moka pots on offer. If you’d like fuss-free coffee and don’t want to worry about burning or getting cold, this is a great option. If you’re looking for a classic design and something that’s easy to clean, this probably isn’t the best choice. Another excellent model from Cuisinox is the Liberta – like the Roma, it comes with a huge 25 year warranty and it can be used on all cooker types. While it is on the most expensive end for moka pots, if you break that cost down by life expectancy, it’s far better value for money than some of its cheaper counterparts. Almost 80% of reviews for this moka pot give it the full 5 stars, which is saying something. An excellent moka pot that delivers quality coffee consistently and will last for years to come. How much coffee do you need? Moka pots come in a huge variety of sizes (from 1-12+ cups) so it’s important to know how many cups you realistically need to avoid over-spending. Some models come in multiple sizes, whereas others only have a single size available so if you need a very small or very large moka pot, this can limit your options. What type of stove do you have? Your stove type has an impact on the materials you can buy – if you have an induction stove, you can’t buy a completely aluminum moka pot since it won’t heat up properly. However, some aluminum pots come with a steel base so it’s worth checking. How will you clean it? If you insist on using a dishwasher, it will reduce the life of your moka pot regardless of the material, but stainless steel moka pots will stand up to dishwasher use far better than aluminum (which you should not put in the dishwasher at all, as a rule). Moka pots use pressure and steam generated by heating water to brew coffee. A moka pot is made up of 3 chambers: the bottom chamber is where you pour your water, the middle chamber is where you put your coffee grounds, and the top chamber is where your brewed coffee ends up. The water at the bottom of your moka pot gets heated – the heat and increased pressure force the water upwards into the middle chamber with the coffee grounds. The water passes through the grounds, picking up the delicious taste, oils, and aromas, and eventually the brewed coffee travels up into the top chamber. Once it’s ready, you just pour and drink your coffee with no more fuss – no playing with pressure gauges, no wondering when to plunge, just easy, quick coffee on your stove top. Once you hear a gurgling sound, it means that the bottom chamber is empty and all of your coffee is brewed. It’s important to listen to your moka pot, since over-heating your coffee will burn it. It’s a good idea to boil your water before putting it into your moka pot rather than relying on the pot to heat it from cold. If you have to wait for the water to heat and boil before your coffee starts brewing the grounds will be exposed to more heat over a longer time, which can affect the flavour of your coffee. Moka pots make delicious coffee, but it’s not espresso. Espresso is only made using an espresso machine that uses the right pressure and makes the coffee much more quickly. You typically use the same grind as you would for an espresso, but the crema is not as rich as you get with an espresso. Since the coffee from a moka pot is not technically espresso, some coffee lovers will say that you can’t make lattes or cappuccinos with it either. Ultimately, you can make black coffee in shots or larger amounts, and you can use that as a base to add milk and milk foam in whatever proportions you like. It may not make espresso, but a moka pot does make great tasting coffee. If you definitely want espresso in the mornings, take a look at our top 10 espresso machine reviews to find the perfect option for your kitchen. 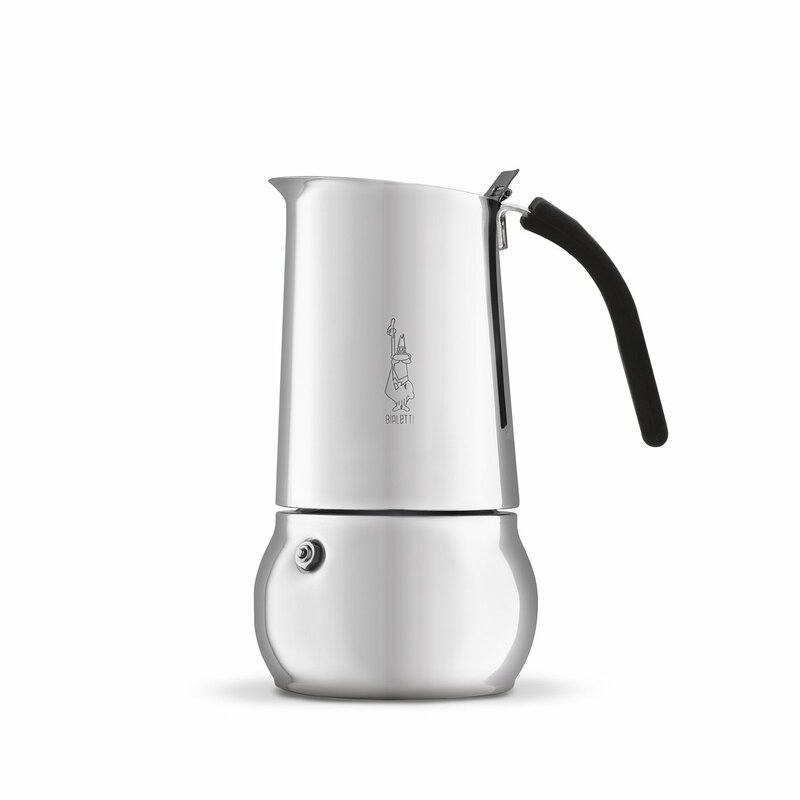 Aluminum moka pots are traditional and typically preferred by a lot of purists. One of the reasons for this is that aluminium can build up an oxidized layer on the inside of the pot which reduces any metallic taste the coffee might develop while brewing – this is highly contended and largely a matter of personal taste rather than absolute fact. 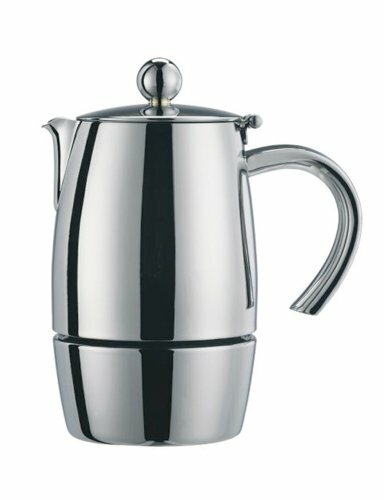 Stainless steel moka pots are easier to clean and will generally last longer because they do not corrode as easily. 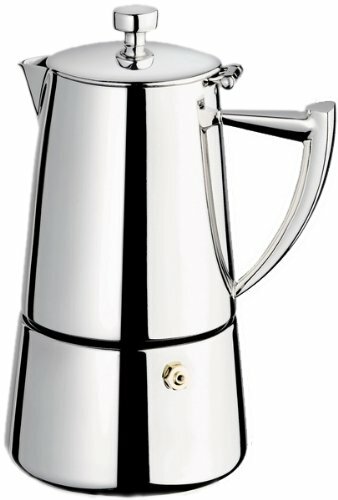 Other considerations are cost and strength – aluminum is cheaper to buy and manufacture, which typically makes these moka pots cheaper, but stainless steel is considerably stronger and will survive more travel and clumsy mornings. 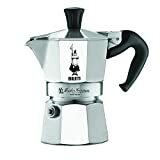 If you are buying a stove-top moka pot, you will need to know whether or not you have an induction hob – if so, you will need to buy a steel moka pot since you will not be able to heat aluminum on your hob (unless it has a steel base). Alternatively, you can buy a moka pot with an electric base that does not need to be heated on the stove at all.